A masterclass from spearhead Jake Waterman propelled West Coast to its first WAFL victory on Saturday. 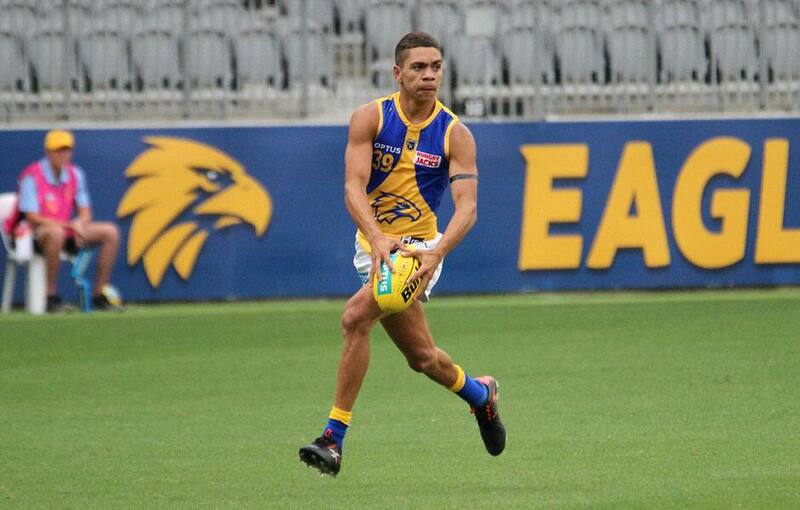 The Eagles made history at Optus Stadium upon recording a clinical 11.11 (77) to 6.14 (50) victory against Peel Thunder in a curtain raiser to RAC Derby 49. Waterman bagged five goals for the second week in a row in a commanding display that will undoubtedly put him in the frame for an AFL recall next week. Skipper Fraser McInnes got the Eagles off to a perfect start with a strong contested grab and straight set shot in the opening minutes. But Peel fired back with consecutive goals to steal the lead midway through the opening term. West Coast responded via Jarrod Cameron, who banged a beautiful banana through the big sticks, and when Waterman got on the board for the first time the blue and gold side had an eight-point advantage as the quarter-time siren sounded. Waterman started to wield more influence in the second term, booting back-to-back goals to bump the Eagles’ buffer to 21 points. He struck again early in the third term, reeling in a huge contested mark and kicking truly from 35m, and when Andrew Fisher and Jarrod Brander chimed in with majors of their own the wing-clad side had a 25-point lead at three-quarter-time. Waterman put a dagger through Peel’s heart with his fifth major just minutes after the resumption of play before Bailey Williams and Brendon Ah Chee rubbed salt into the Thunder's wound with late goals to cap off the 27-point win. The forwards flourished off the back of solid performances from midfielders Jackson Nelson (27 disposals), Matthew Allen (25), Ah Chee (24) and Josh Smith (20 and six inside 50s). Hamish Brayshaw made a strong return from injury, collecting 22 disposals and laying eight effective tackles, while Xavier O’Neill (13, eight tackles) bounced back from a quiet outing against Perth with an eye-catching performance against Peel. West Coast rookie Harry Edwards (six marks) impressed in defence, as did dependable backman Will Schofield (12, four marks) and WAFL Eagle Andrew Fisher (17, six marks), who bobbed up and won several crucial contests throughout the match. Keegan Brooksby (27 hitouts, six tackles) held his own against Peel’s three-pronged ruck attack, but succumbed to an injury late in the fourth quarter and did not return.